I say this quite often on this blog, my family love fresh fruit desserts. Here is yet another one that they love that allows us to enjoy fresh summer raspberries. I love this cookbook titled Easy, as the recipes are indeed easy. This one is quite quick to prepare, I make it after dinner, takes about 15 minutes to make, then I put it to bake whilst we relax and chill before dessert. Dessert is something special in my house, I don't do one every night, but when I do there is a bit of excitement amongst my kids, even my husband who says he doesn't like dessert, tends to like mine. This dessert is actually quite light, the cake part is spongy and delicious and underneath you get this saucy raspberry like sauce. Now when you bake this the top needs to feel spongy, it will be golden when done, but if you cut into it and it is really liquid underneath, just let it sit a few minutes more, the longer it sits the more it will set. I quite like it runny, but if you want a more baked custard feel, allow to sit a bit more. It is like you get two different desserts a self saucing one and a custard one. I have actually made this in a larger dish also, works just fine, you just get a slightly thinner cake. 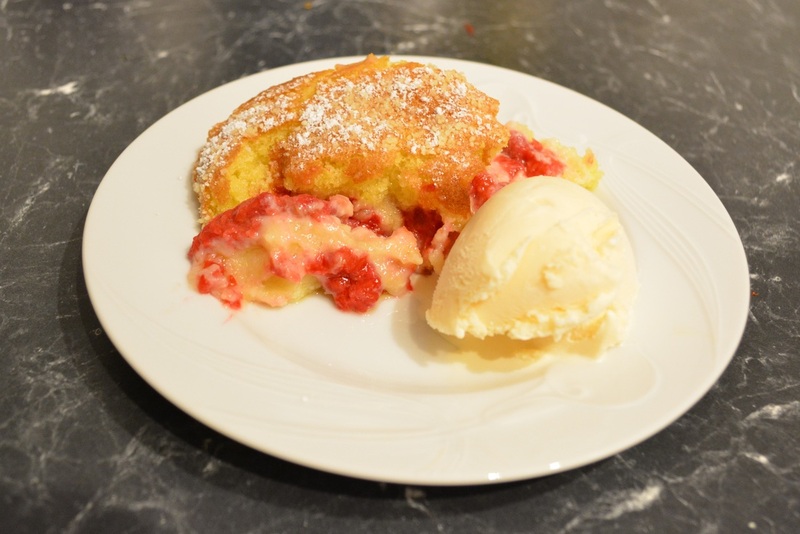 If you love raspberries, give this cake a go, it is lovely and light and a perfect way to end a meal. Grease a 1 litre shallow baking dish (this dish will need to fit into another larger baking dish when it comes time to bake it). Scatter the raspberries into your greased baking dish. Combine the flour, baking powder and salt into a large bowl. In a small bowl add the buttermilk, the melted butter, egg yolks, sugar and lemon zest, whisk to combine. Pour the buttermilk mixture into the flour mixture, stir to combine. Using electric beaters, beat the egg whites in a medium sized bowl until stiff peaks form. Add half the egg whites to the buttermilk batter and fold in gently using a metal spoon. Now add the remaining egg whites and gently fold in until combined. Spread the batter over the raspberries in the baking dish, place this dish into the larger dish. Carefully pour boiling water into the larger dish until it reaches halfway up the sides, creating a bain marie. Do not get water into the batter. Place in your preheated oven and bake for 40-50 minutes or until puffy and golden. Set aside for 10 minutes to cool and set further, then dust with icing sugar and serve with vanilla ice cream or custard.